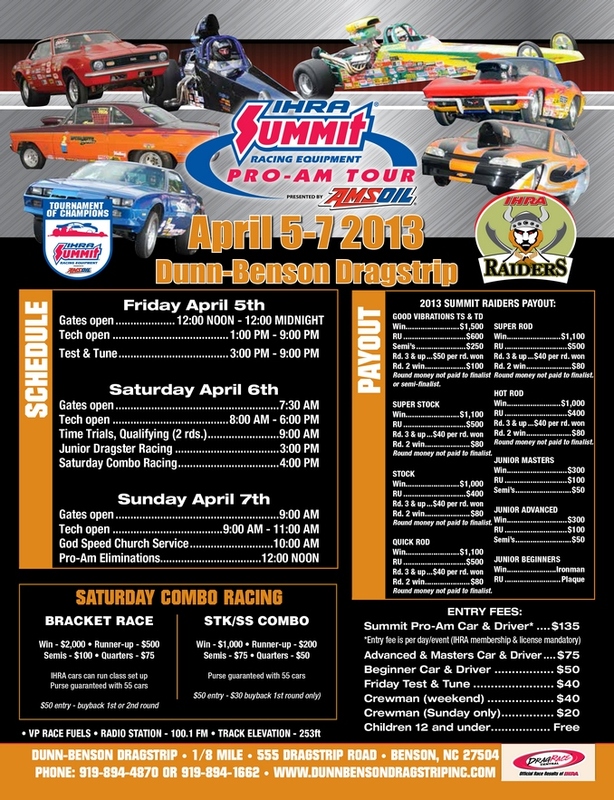 The 2013 IHRA Summit Racing Equipment Pro-Am Tour presented by AMSOIL Division 9 season officially kicks off April 5-7 at Dunn-Benson Dragstrip in North Carolina after the previously scheduled season opener at Piedmont Dragway was rained out. Always one of the toughest divisions in the country, the 1/8 mile showdown will feature a full racing weekend with a test and tune on Friday, qualifying on Saturday and eliminations on Sunday. 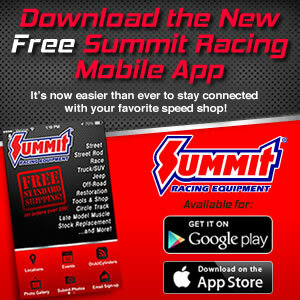 WHAT TO EXPECT: With weather postponing Piedmont, Dunn-Benson will be the first race of the year for Division 9. Huge crowds of racers are expected and track owner Roger Williams and track manager Crystal Jackson look forward to seeing all the great racers of the Raiders Division. Friday gates will be open from noon until midnight with tech open from 1-9 p.m. and a track hosted test and tune from 3-9 p.m. Saturday gates will open at 7:30 a.m. and tech will be open from 8 a.m.-6 p.m. Two rounds of time trials/qualifying will begin at 9 a.m. with Junior Dragster eliminations to follow. A track hosted bracket race and Stock/Super Stock combo will start at approximately 4 p.m. Sunday gates will open at 9 a.m. with tech open from 9-11 a.m. followed by God Speed church service at 10 a.m. and final eliminations beginning at noon. FAST FACTS: Division 9 has regularly held races at Dunn-Benson Dragstrip since 2010…Chris Dean has dominated the track, visiting four finals in the past three season with three wins, two in Hot Rod in 2012 and 2011 and one in Super Rod in 2011…Other multi-time finalists at Dunn-Benson over the past three seasons include Donny Urban with a win and runner-up in 2012 in Top Sportsman and Top Dragster, Donald Webb and a pair of Junior Dragster competitors in Jason Craft with an Advanced win in 2012 and Dylan Blanton with an Advanced win in 2011…Division champions Jeff Estep, Chris Dean and Kaylee Creech were finalists at the 2012 Dunn-Benson meet.